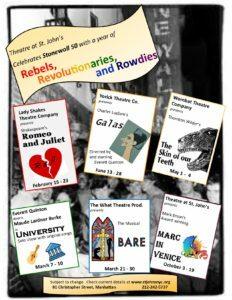 The theatre companies that call Theatre at St. John’s home are joining together to celebrate the monumental anniversary of the Stonewall Uprisings of 1969. Almost every production staged this year will connect with the Stonewall legacy of freedom, liberty, courage, resistance, pride, speaking out, and being out. Whether by author, through theme, or in the production concept, this dynamic legacy will be engaged. Watch for details regarding show schedule and ticketing details.